(Ashgate, 2010) x + 190 pp. Reviewed by Elizabeth Helsinger on 2011-06-08. "Mature," in Swinburne's case, is a deliberately provocative word. Did he really stagnate creatively, as so many critics have concluded, after Theodore Watts-Dunton took him to suburban Putney? Swinburne was barely forty, with thirty years and many books to write before his death in 1909. 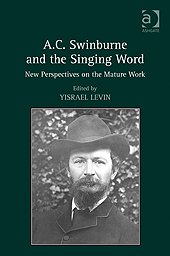 Rather than directly address the challenge posed by Levin ("to respond to this view and disprove it"  ), most of the essays in this generally stimulating collection proceed by setting aside Swinburne's work of the 1860s and early 1870s to see what his work might look like without the overwhelming presence of Poems and Ballads, First Series (1866). So brilliant and deliberately sensational was this early book that, as Stephanie Kuduk-Weiner puts it, "for both his first readers and for more recent scholars" it has "set the terms for interpreting, evaluating, and assessing the significance of all of his poetry" (13). The Swinburne that emerges in these pages doesn't so much address the charge that he was a lesser poet in the Putney years as suggest several different ways of characterizing what he was doing all along, posing in fresh terms the question of what his importance to modern poets and critics might be. As the few have been saying for some time, Swinburne's literary intelligence and poetic achievements are as startling as they have been difficult to discern. Kuduk-Weiner's "Knowledge and Sense Experience in Swinburne's Late Poetry" is probably the most penetrating essay of the collection. She argues that Swinburne's real subject was "the mediating role language plays between sensation and knowledge," a topic right at the heart of late Victorian empiricist psychologies of perception (visual and auditory). Focussing on A Century of Roundels  but also looking back to "Sestina" and "A Ballad of Dreamland" from Poems and Ballads, Second Series (1878), she treats two kinds of poems prominent in Swinburne's work after 1870, beginning with the often stunning poems of natural description (like those that constitute "A Midsummer Holiday," or "By the North Sea" and "The Lake of Gaube"). While these poems might seem uncharacteristic in their emphasis on the referential capacities of words, they are balanced by a second group: sound-driven poems which explore how elaborate verbal patterns (rhyme, alliteration, assonance, repeated words, rhythmic beats and pauses) can move both poet and readers, and move them toward unexpected meanings (perhaps affectively as much as rationally grasped) by linguistic echo and association, prompted by doublings or delays at both the sensory and the figural level that cut across logical structures supported by syntax. She argues, correctly I think, that in both groups of poems Swinburne pursues what he repeatedly calls "the spirit of sense" or its "soul" (cited 12): sensation mediated for perception by the metaphoric and associative acts that poetry -- at once referential and sensory -- can perform. Though Kuduk-Weiner does not say so, exploring the nature of perception in the experience of an aesthetic work was a project that Swinburne shared in the 1860s with his artist and poet friends, particularly D. G. Rossetti and Edward Burne-Jones. Their mutually informed experiments in poetry, painting, and art criticism were further developed and analyzed by Walter Pater. If there is a shift from Swinburne's earlier to his later work, it is in the new prominence of poems about natural (not painted) land- and sky- and sea-scapes -- dispensing with the double mediation of writing about pictures. (Unless, perhaps, as Oscar Wilde might have claimed and John D. Rosenberg has argued, Swinburne's poems about the sea are themselves imitations of the Turner paintings that shaped his visual sensibility in his youth. ) Many of these poems also use extreme versions of poetic sound- and figure-patterning to explore the sense-based meaning that poetics can generate from the experience of real places no less than of paintings. But if painting plays a lesser role after the 1860s, Swinburne nonetheless continues to explore how poems mediate the experience of other poets' poems, moving poets and readers to thought and feeling by echoes and repetitions across deep temporal, linguistic, and cultural space. Kuduk-Weiner's essay is, as David Riede comments in his "Afterword," "a perfect example of how the observation that Swinburne lived too much among words may transfigure from blame to praise" (173). It is a promising avenue for reclaiming the poet for serious students of poetry and poetics. But some would like to do more: "The task of Swinburne criticism now," Riede writes, "is to demonstrate with careful close readings the assertion long ago made by Cecil Lang: 'Swinburne was a thinker'" (171-2). Lang was praising Swinburne's specifically poetic intelligence: his poems, wrote Lang, "nearly always embody 'fundamental brainwork,' as Rossetti called it, and it is inaccurate and unjust to say that in them the sound obscures the sense" (The Swinburne Letters [1959-62] xix). At times, however, Kuduk-Weiner, Riede, and more insistently, Levin wish to cast Swinburne as a major figure in Victorian intellectual history or as a philosopher or theologian whose mind is that "of a profound and sophisticated thinker" and whose "mature theological thought" might be worth studying in its own right (Levin, "Introduction," 3). But here one thinks uncomfortably of similar claims for Browning made in the nineteenth century by members of the Browning Society. Neither Kuduk-Weiner's nor Levin's essays provide the comparative evidence for such claims, which seem to misunderstand the kind of poetical thinking to which Rossetti, Lang, and Jerome McGann have drawn attention and which Kuduk-Weiner's own readings support. (See McGann's Swinburne: An Experiment in Criticism  and more recently, the introduction and notes to Major Poems and Selected Prose ; see also Simon Jarvis, "Prosody as Cognition," Critical Quarterly ). In the rush to restore "sense" to the sound of Swinburne's poetry, we should remember that his ideas matter as they inform the poetry, and not necessarily the other way around. For Swinburne, the "spirit of sense" is language in poetic form, language as sense-that-thinks more and differently from prose. As Swinburne wrote of William Jenning Bryant's "Thanatopsis" and Lowell's "Commemoration Ode," they are "excellent good speech but if given us as song [their] first and last duty is to sing... . the thing more necessary though it may be less noble ... is the pulse, the fire, the passion of music -- the quality of a singer, not of a solitary philosopher or a patriotic orator" (Letters, III.9). In Levin's own essay on Swinburne's myth of creation, he is at his best when explaining in detail the "mythopoetic ecology" (67) of "By the North Sea" and other late poems of natural description. Here Swinburne's efforts to move from sense to the "spirit of sense" create what Levin calls "a material vision of spirituality" (71) where mythopoesis constructs an autonomous natural "system" of symbiotic relationships among elemental forces (sun, wind, land, sea) which has no need of a creator or human witness (70). This thematic reading, though not unattuned to the way poetry communicates through its own systems of sound and figure, does not well explain why these have always seemed important to readers of Swinburne. Mapping conceptual networks in Swinburne's Songs of the Springtides, John Walsh probes more deeply than Levin the systematic character of Swinburne's thought-constructions as poetry (or what Swinburne consistently calls "song") by turning to computer-enabled analyses made possible by his years of work on The Swinburne Project, a digital Web-based collection of Swinburne's works. Noting first of all Swinburne's careful attention to the structure of Songs Before Sunrise, Walsh then applies the sorting potential of XML (eXtensible Markup Language) to discover -- with the help of his digital tools -- further evidence of structural planning at the micro-level of repeating phrase and trope. Such micro-repetitions support the more easily visible relationships among the long poems of Songs Before Sunrise and sketch the outlines of that "mythopoetic ecology." While it must remain an open question whether old fashioned close-reading and a good memory might not lead to the same conclusions (and perhaps shaped the construction of the digital search to begin with), Walsh demonstrates what a sensitive application of digital search functions can show: that both within and among Swinburne's poems, the dense networks mapped here centrally informed Swinburne's poetics. Including patterns created by sound and rhythm alone, as Kuduk-Weiner explains, these networks constituted both an axiom of his metaphysics and a working strategy for the construction of his poems and volumes. By these networks he makes sense think. Two essays convincingly show how Swinburne's writing was shaped by a different kind of mythopoesis. Brian Burton's "Swinburne and the North" and Charlotte Ribeyrol's "A Channel Passage: Swinburne and France" read Swinburne's repeated self-identifications with Northumbria and France as sustained acts of autobiographical myth-making. ("Swinburne," Burton points out, "was not averse to mythologizing his genealogy and passing off romantic fantasies as biographical fact" 77). But both essays also make clear that such mythmaking was a forceful stimulus to poetry. As Burton puts it, Swinburne's Jacobite songs, border ballads, and his late, great epic, "The Tale of Balen" (set in the North) "give him a tangible sense of belonging to a region whose landscape and people he genuinely loved" (78). Ribeyrol's contribution reminds us that this assertion should be made in the plural. Conjoining history with myth through poetry meant for Swinburne claiming a double personal inheritance: the Northumbrian Swinburnes' Jacobite history included several periods of political exile in France. Swinburne's "tangible sense of belonging" leads him not only to the rhythms and language of Border ballads and Jacobite songs but also to those of his second language, French. This French poetic heritage notably included the counter-cultural linguistic and formal innovations of its medieval modern criminal-poet, Villon; the romantic republican songs of the exiled Hugo; modern poems of Parisian streets in Baudelaire's Les Fleurs du Mal; and the hermetic poetic and linguistic experiments of Mallarmé . Even Swinburne's signature on the manuscript of "Ave Atque Vale," Ribeyrol suggests, has been deliberately altered from its habitual form to suggest how fully, if for ambivalent reasons she thinks, he means us to read his poem as homage to the dead French poet's songs (following Baudelaire's "Ch. Baudelaire," he signs the elegy "Algernon Ch. Swinburne" ). In the effort "to capture a sense of his family's doomed heroism but also to assume vicariously the romanticized role of rebel and outcast for himself" (Burton 77), Swinburne adopted what he saw as Northumbrian qualities of "fortitude, resilience, temerity, determination, fearlessness, moral virtue," fueled by fierce local loyalties and issuing in violent actions. These qualities, he believed, were directly fostered by the unforgiving landscape of the North and expressed in the stark songs of its outlaw Reivers. As Burton sensitively notes -- in an essay that is rich in suggestive detail about Swinburne's long engagement with the country and its historical and verbal culture -- the fusion of an essentially aristocratic personal heritage with the language and music of local sheep and castle rustlers is not without its contradictions (75). Yet Burton's and Ribeyol's stories of how Swinburne appropriated Jacobite and Hugoesque romantic republican song help us to understand Swinburne's double "instinct to conjoin myth and history" and "correlate song with sea" (79). Thus their stories usefully anchor Swinburne's "mythopoetic ecology" not only in the particulars of a landscape's past and present but also in what for Swinburne were its distinctive "pulse ... [and] fire ... [and] passion of music"-- the qualities of first importance if one is a poet and not "a solitary philosopher or a patriotic orator." Ribeyrol's essay also usefully sketches Swinburne's shifting reception in France. In the 1860s, the British viewed him as a subversive French import: anti-theist and obscene, like the object of his enthusiasm, the Marquis de Sade. But in France by the 1870s he was hailed by a younger generation both as a leader of an English "pagan" school and as a master formalist -- evoking classical Greece as a site of formal perfection as well as of political and sexual liberty. He was adopted as honorary progenitor (along with Gautier and Banville) by poets of the New Parnassus. In the 1880s, on the other hand, he began to be portrayed as a corrupting English influence on French poetry and mores. Not until the early 1900s was he again praised in France, but for much of the twentieth century he was generally regarded more highly there than in Anglophone countries. Like Ribeyrol's and Burton's, the remaining essays in this volume suggest new areas for scholarship or cast an equally useful eye back at the history of Swinburne's critical reception and (mis)construction. Catherine Maxwell's "Swinburne's Friendships with Women Writers" is extensively documented and generously offered as "a starting place for others interested in researching this so-far underexamined area" (128). Her brief accounts of his surprisingly extensive engagements, personal and literary, with Christina Rossetti, Pauline Trevelyan, Mary Gordon Leith, Elizabeth Siddal, Adah Isaacs Mencken, Mathilde Blind, Eliza Lynn Linton, Louisa Molesworth, Anne Thackeray Ritchie, and Louise Chandler Moulton -- some of them known and others rarely mentioned -- should be a rich resource. Nick Freeman's essay on A Study of Shakespeare (1880), Swinburne's major labor of love that is also full of considerable critical insight, situates it within Shakespearean scholarly debates of the period. Rikky Rooksby has already contributed much to the recent revival of Swinburne studies by co-editing (with Nicholas Shrimpton) the last collection of essays on Swinburne (The Whole Music of Passion ) and authoring an important biography (1997). Here, in "Selecting Swinburne," he painstakingly examines thirty-one Swinburne anthologies published in Britain and the U. S., from the first in 1887 (probably edited by Watts-Dunton, choosing primarily poems from 1880-88) through Rosenberg's eye-opening 1968 collection (with generous selections from "Tristram of Lyonesse" and late landscape poetry, for Modern Library) down to the most recent (collections edited by Catherine Maxwell for Everyman  and by Jerome McGann and Charles Bligh for Yale , the latter "undoubtedly the best Swinburne anthology there has ever been" ). Since, as Rooksby amply demonstrates, "selecting Swinburne is, more than with most poets, a judgment about the kind of poet an editor sees him to be, and what view the editor takes about the value and shape of Swinburne's artistic career" (149), Rooksby's turns out to be an illuminating history that supports the volume's premise, though with some interesting exceptions. Swinburne's poetry of the 1860s has indeed often dominated what is available in print not only to the detriment of fine later work but also to the considerable skewing of the terms in which we understand this most original, yet most poetically learned poet's preoccupations and achievements. Finally, David Riede (himself an early pioneer with Swinburne: A Study of Romantic Mythmaking ) uses his "Afterward" to put even the evident renaissance of informed interest in Swinburne into sobering perspective. While welcoming the rightly-earned excitement generated by critics who have recently probed the enigmas of Swinburne's verse, like Kuduk-Weiner, Maxwell (The Female Sublime from Milton to Swinburne  and Swinburne ), and Yopie Prins (Victorian Sappho ), Riede rightly argues that neglect and misapprehensions still shroud his achievements. In fifty years we have seen just a handful of monographs and four collections of essays on Swinburne -- two of them special issues of Victorian Poetry, Lang's in 1971 and Rooksby's and Terry Meyers' in 2009. In our era of forced academic overproduction, this is really very little. Critical fashions undoubtedly have something to do with it, yet the challenge remains. Elizabeth Helsinger is Professor of English and Art History at the University of Chicago. Leave a comment on Elizabeth Helsinger's review.